This is a photograph that I took during my recent adventure at Halibut Point up in Rockport, Massachusetts. I took lots of photos of granite cliffs and dramatic ocean views, but I also took photos of some of the details along the way. 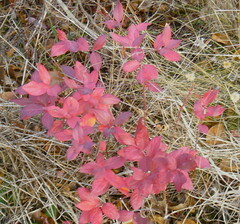 I liked these little red leaves and the contrast with the texture of the dried grass. I cropped the original image to get this composition. 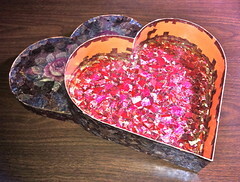 I continued to work on this project over the weekend, a heart-shaped box that I am covering with collage and decoupage made from printed metallic ribbon. This photo shows the area that I am working on, the inside wall of the box, and also shows the inside of the top of the box. 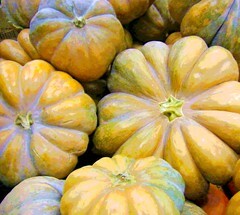 This is a posterized photograph of some pumpkins that I saw last month at Trader Joe's. The sign said "Cinderella Pumpkins." I liked the shapes, so I took a picture. Soon after, I received my own Cinderella pumpkin on the last day of The Food Project. The pumpkins were still green, but we were told to keep them and they would ripen. I intended to use the pumpkin for Thanksgiving, but I got too busy to fool with it. I also intended to post the photo for Thanksgiving, but I didn't do that either. But last night, I finally roasted my Cinderella pumpkin, and am now looking for recipes for pumpkin soup. And today, I finally used Painter to posterize and crop the original photo. This is a collage and decoupage project in progress. 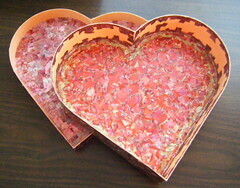 I am covering this heart-shaped box with patterns cut from printed metallic ribbon. Over the Thanksgiving holiday, I had a chance to work on it a little bit. This photo shows the top of the box as well as the interior. At this point, I am trying to cover the interior wall of the box with a pattern that is predominantly pale pink, with rose, blue, and green in it as well. As usually, I am worried about running out of this ribbon, and may have to use some additional patterns to finish. I enjoyed getting back to this project, even for a short time. This is how it looked on Friday. Here is one more of the digital leaf "prints" I have been making on the computer this week. 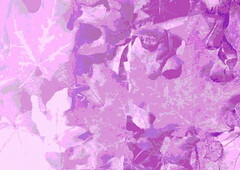 These are images created with my Painter program's pattern pen and a leaf pattern created from one of my photographs. (They aren't really prints, but the process and the results remind me of printmaking.) This one is almost abstract. This is another one of the digital leaf "prints" I have been making. I use my Painter program to make these images, and they aren't really prints, but they kind of look like prints to me. 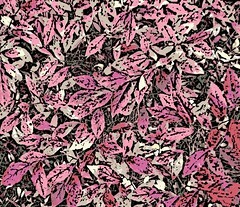 I turned one of my photographs of leaves into a pattern in Painter. 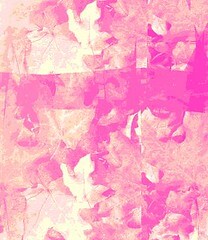 Then I used Painter's pattern pen combined with posterizing and color overlays to create this look. The final step was to crop, and in some cases, I created multiple images out of one. This is the first in a series of images of leaves that I created last week on the computer. I call these images digital prints because the way they look and the way they are made remind me of printmaking in some respects. To make this image, I used Painter's pattern pen, loaded with the pattern that I created last week from my photograph "Fall Colors". I used colored "paper" and loaded the pattern pen with digital pastel. I chose a large size for the pen, put down a few strokes where I wanted them, and then posterized the image. I also added a color overlay in yellow. The last step was to crop the result to get this final image. Here's one more photograph from last weekend's adventure at Halibut Point. I took this photo on one of the narrow trails that lead from the scenic overlook down to the ocean, through huge boulders and tall brush. I liked the contrast of textures and colors in this view. Tonight I cropped the original photograph to get this composition. 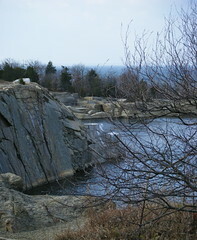 I took so many photos at Halibut point. Maybe some of them will be useful for painting. I will come back to this set of photos again, but I also want to post some of the digital leaf prints I have been working on. That's what I hope to do tomorrow. . . . Here's another photograph from my adventure at Halibut Point over the weekend. 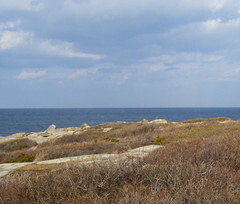 This was my first visit to Halibut Point in Rockport, MA, and I took a lot of pictures. (Don't worry; I am not going to post all of them.) I took this photograph from the scenic overlook. The brochures say you can see as far as Maine and New Hampshire. I don't know if the land masses in the distance are New Hampshire and Massachusetts, or just Crane's beach, but I like the effect when you look at the horizon line. I like the play of horizontal and diagonal lines in the photo, so I used iPhoto to crop it to get this composition. This might make a good composition for a painting. My unexpected adventure this weekend was a trip up to Halibut Point State Park in Rockport, MA. 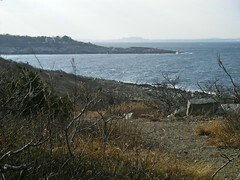 Although I have lived in Massachusetts for quite some time, I have never been at Halibut Point before. I was amazed at the dramatic setting: granite cliffs, a quarry, huge tide pools, and ocean vistas. Despite the dramatic cliffs, the trails are easy enough, and I took pictures along the way. This is a view looking down at the quarry and out towards the ocean. Today I was thinking about using digital patterns in Painter. I thought I had created some patterns of autumn leaves, but I couldn't find what I was looking for. Pattern files seem to disappear when you upgrade Painter, and I have never figured out how to solve the problem. However, creating a pattern from an existing image is a snap. So I poked around in my image files and found a posterized photograph of leaves, called "Fall Colors" that I posted here back on Nov. 30 0f 2007. 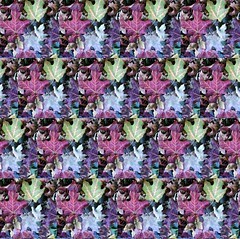 I opened the image in Painter and "captured" it as a pattern. 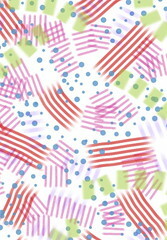 Then I opened a new image, and used the paint bucket tool to fill it with this pattern. Then I cropped it, and here it is. That was all I had time for today, because I had a sudden invitation to have an adventure, so I quickly saved this file before I grabbed my camera and set off for Halibut Point. Now I will be able to use this pattern with my pattern pen to make "digital prints". I hope to be able to do that sometime this week. Coming soon: more with this pattern, and photos from my adventure at Halibut Point. After weeks and weeks of too much to do, I finally had a chance to work on this project. 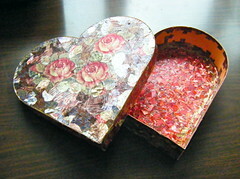 I am covering this heart-shaped box with collage and decoupage created from printed metallic ribbons. Yesterday I worked on the inside wall of the box. I started working on this late in the afternoon, and it was nearly dark when I took this photograph. First thing this morning, I set off for the grocery store to get half-and-half (among other things). I decided to stop at Starbucks first and have coffee: tall dark roast with extra room . I sat down to drink it, and took out my new iPhone. I installed Brushes on it a few days ago, and had only had time to make a few strokes to try it out. So this morning started trying out the brushes just to compare (I also have Brushes on my iPad) and came up with this little abstract sketch. I was having so much fun that I almost forgot about the grocery store. Later, I transferred the image into my computer, and used iPhoto to crop it a bit to adjust the format, which is predetermined by the shape of the iPhone screen. Apparently the iPhone version of Brushes doesn't capture a "stroke-by-stroke" video like iPad version does, but it is still great to have Brushes on my iPhone because it is so portable. Tonight I cropped this image from a photo that I took last Friday afternoon during a walk at the Cummings Center Pond, here in Beverly, MA. Walking at the Cummings Center is usually pretty routine. 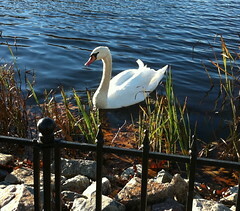 But as I parked the car, I saw a swan right at the edge of the water. It is not unheard of to see swans at the Cummings Center Pond, usually during the summer, but they usually stay in secluded areas off in the distance. This swan seemed used to people (even people accompanied by a small dog), and seemed quite calm about being photographed. So I took several photographs of this beautiful bird. This image is from one of the best of the photos. This is the fourth in a set of four images that I made from a photograph that I took recently. My starting point was a picture that I took this week through an upstairs window. A version of that photo, "Through a Window in November," was published on this site on November 12th. 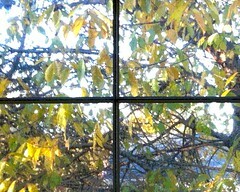 I used iPhoto to make four copies of it, and then cropped out the view of each of the four window panes in the picture. I used my Painter software to add posterizing and color overlay to each of the four images. This image is the view from window pane on the lower right. 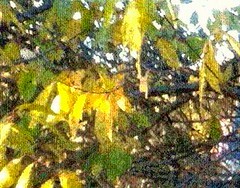 This is part of a set of four images that I made from one of my photographs, "Through a Window in November," posted three days ago. I duplicated that image and cropped out the views from each of the four windowpanes, making an image of each one. Then I re-posterized and used color overlays on each of the four images. This one is Window Pane 3, which is the one on the lower left. Two days ago (November 12) I published my posterized photograph of a tree seen through a window. I thought the view through each of the four window panes in that photo could each stand alone as a composition. So yesterday, I used iPhoto to duplicate and crop that first image, creating four compositions, one for each window pane. Then I used Painter to adjust the brightness, and added more of the posterizing to each image, as well as color overlay in pale yellow. So I created a series of four images from one. This is the second image in the series, the view through window pane 2, top right. Yesterday I posted a posterized photo that I took of a view of November leaves through a window. The four window panes in that photo seemed to suggest four "found" compositions. So today, I duplicated the photo, and cropped four times, to get the composition seen through each of the four window panes. This is the view from the first window pane (upper left). Then I opened each of the four images in Painter, adjusted the brightness, posterized them even more, and then used a color overlay in pale yellow. This is the first of the set of four images. This morning, I was admiring the view through an upstairs window. 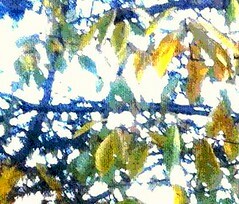 I liked the morning light on the green and yellow leaves, so I decided to try out the camera in my new iPhone. Tonight I used iPhoto to crop this composition out of the original photograph, emphasizing the window panes. Then I opened the image in Painter and posterized it. This morning when I took the photograph, I already knew that I was going to posterize the image because I was shooting the photograph through a window screen. That is usually a liability, but posterizing with Painter turns the liability into an advantage because it creates interesting effects with window screens. As I worked with this image tonight, it occurred to me that the window panes create four compositions, not just one. To be continued. . . . I recently posted photographs that I took at Long Hill Gardens (here in Beverly, MA) of the view looking up and down the main road (posted here on Nov. 4 and Nov. 5). While I was at it, I also took some pictures of the berries on the trees that line the road. The trees are wonderful in all seasons, but I love the berries! 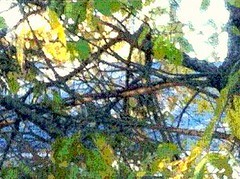 The berries even outlast the leaves and add some color to November. Tonight I cropped this image out of one of the photos. 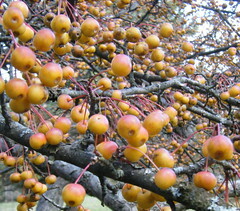 I couldn't identify the kind of tree this is, so I went on Google and found out that this is a Winter King Hawthorn. 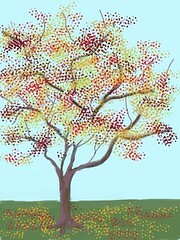 Yesterday I posted a digital sketch of a tree that I drew using the Brushes app on my iPad. As you draw, Brushes captures a stroke-by-stroke video. This time, the little video somehow stopped short, so I used iMovie to add the still photo (with Ken Burns effect) and then added a second clip from the video. It's not perfect, but hey, I am still learning (thanks to the folks at the Apple Store). To see the little video, just press play. Yesterday I took my car in for an oil change. That meant spending about an hour waiting around at a nearby Starbucks, so I decided to take my iPad along. I used the Brushes app to make this little sketch, working from my imagination. I had a great time, and was (almost) sorry to hear that my car was ready. 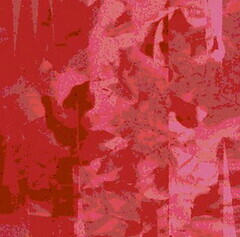 Here is another image created from my recent photograph of red and yellow leaves. This one is a digital woodcut that I made using my Painter program. It took a number of tries to get the right amount of black. The image was too complicated, so I reduced the number of colors, and that helped. Afterwards, I decided I wanted to see more yellow, so I put in some color overlay using the magic wand tool, one tiny area at a time. I used Painter to posterized the photograph that I published here yesterday: a picture of autumn leaves that I took last week at Long Hill Gardens, here in Beverly, MA. 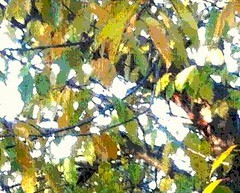 This is cropped from a photograph that I took last week during a walk at Long Hill Gardens, here in Beverly, MA. 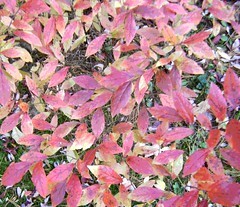 There was a small shrub next to the road with beautiful red and yellow leaves. The colors were amazing! The shrub was growing low enough that I could photograph it from above, so the grass could act as background. Yesterday's post was a photograph that I took of the view looking down the road at Long Hill Gardens, here in Beverly, MA. Tonight I am posting another photograph of the same road that I took five minutes later, looking back up the road at where I had been. In this view, you can see the trees covered with berries. I would like to paint this road, maybe for the show that is coming up in May. This is a photograph that I took on Monday during a walk at Long Hill Gardens, here in Beverly, MA. The fall colors were subtle, but still amazing in the late afternoon light. 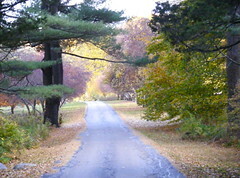 This road leads from the main house and gardens down to the children's garden and the field. 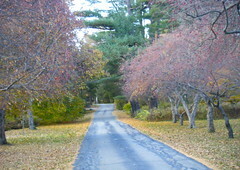 The trees that line the road are covered with berries now, which adds to the color in the photo. Tonight I used iPhoto to crop the original image just a bit, and also used the "retouch" tool to make a small street sign in the distance disappear. 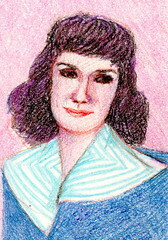 This is a crayon sketch of my mom that I started several years ago; I recently came across it while cleaning up my studio. It is based on a black and white photograph that hangs in my house. I pass it twenty times a day. (I plan to post the photo tomorrow.) I think I started this drawing based on the photo but working from memory of it (it isn't exact enough to be a drawing from observation), and then referred back to the photo to correct some of the details. I wanted to see if I could draw her face from memory. So it isn't really a portrait, but I like the little sketch anyway. This morning I got out my crayons again (yes, of course I still have crayons!) and finished it up, correcting a few things that were bothering me. I decided to post this today because she was born on November 2. Working on this today reminded me of sitting at the kitchen table as a little kid and watching my mom demonstrate her drawing skills. She liked to draw little sketches of people, drawings that looked a little bit like fashion illustrations. (Maybe that's what inspired my obsession with making my own paperdolls. I used to draw them with crayons, cut them out, put them in an envelope, and carry them to school with me.) In art, as with everything else, my mom always made me feel confident but never pressured (not an easy balance for a parent to achieve). Somehow I always had what I needed. As a very small child, I had paints and a little easel, and I still remember taking an art class at the local college when I was in elementary school. And I always, always had a box of Crayola crayons, the big box with 64 colors and a sharpener, the same kind I used to draw this sketch a few years ago, and the same kind I used to finish this up today. 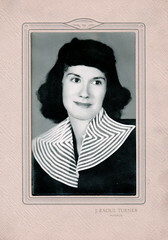 I am still grateful for the crayons, for her vote of confidence, and still grateful that she was my mom. 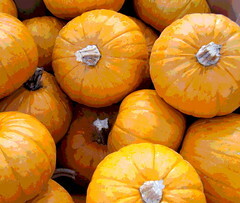 Yesterday I posted a digital woodcut, made from the photo I took of some little pumpkins. I also made a posterized version of the same photograph. Even though the basic image is the same, each technique creates a different mood.